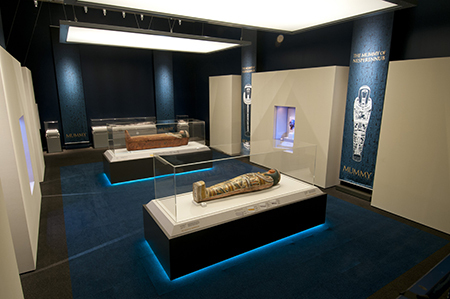 Mummy: Secrets of the Tomb has been a highlight of 2012 at the Queensland Museum in Brisbane. Curated by John H Taylor of the British Museum, the exhibition includes three galleries of ancient Egyptian artefacts, and mummies from the British Museum collections. 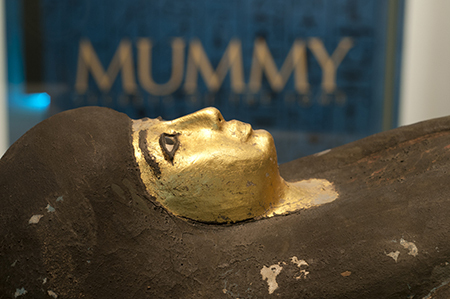 The centrepiece is the intact mummy of an ancient Egyptian priest named Nesperennub, whose life, death and entombment set the theme for the show. An impressive selection of ancient objects contextualises the story of Nesperennub, at the same time highlighting the use of non-invasive imaging techniques in modern Egyptology. The exhibition is reasonably priced, and supported by an informative catalogue, a well-stocked shop, a solid set of related lectures, and a fine display of Egyptian artefacts from the Queensland Museum (including some surprising fragments of the New Kingdom builder Amenhotep’s Book of the Dead, identified by Dr Taylor at the launch of the exhibition in April 2012, and featured on the museum’s website). The exhibition starts in a dark cinema with a 15-minute 3-D video on the history and analysis of Nesperennub’s mummy. Footage zooming in, out and through the mummy displays the results of cutting-edge non-invasive scanning techniques, while the familiar voice of Patrick Stewart encourages the audience to become both Egyptologists and forensic detectives in order to learn more about the man who became the mummy. While actors recreate scenes from Nesperennub’s daily life and mummification, we learn from hieroglyphics on his mummy case and scans of his preserved body inside that he lived around 780 BC (in the Libyan Period of Egyptian history), and that he was an average-height priest of the god Khons, son of Amun-Ra, at the Karnak temple complex of ancient Thebes in Upper Egypt. He was in good health until he died when he was about 40, and then his mummy was buried in a family tomb on the West Bank of the Nile in traditional fashion (but for a clay bowl mysteriously stuck to his head). Though at times this video glories in 3-D for the sake of it, shooting through the mummy like a spaceship, the narration, recreation and cutaway views generally work well together to introduce the mummy, the man, and his times. From the cinema, visitors enter the exhibition proper, a long room divided into three separate galleries. Each gallery displays ancient Egyptian artefacts, mummies and a few modern replicas, accompanied by explanatory texts and illustrations. The galleries were thematically organised under the broad headings of ‘Life in Ancient Egypt’, ‘Tombs and Afterlife’, and ‘The Mummy of Nesperennub’. Besides the focal mummy in the last gallery, the displays ranged from statues, reliefs, models and ritual objects to whole coffins and other mummies. Most artefacts were of high quality and attractively mounted. Although some were closely related to Nesperennub, the exhibition could have benefited from a more historical organisation that built up to the display of his actual mummy. A basic chronology and map of ancient Egypt would have helped, as would a diagram of the temple where Nesperennub worked, and some of his genealogical and archaeological background. Much of this is available to purchasers of the catalogue. The first gallery, on ‘Life in Ancient Egypt’, focused on ancient Egyptian gods, rituals, beliefs and religious practices of the living. Nesperennub’s historical context as a priest who lived in 780 BC is suggested by statues of his Theban triad of Amun-Ra, wife, Mut, and son, Khons, while other artefacts on display were used by priests like him to make offerings to the gods: incense tongs, bucket, ladle, libation vase, offering table, shrine, statues and votives. Relief sculptures present images relating to his priestly religious practices, except for the figure of the God’s Wife of Amun, who was chief priestess at Thebes after Nesperennub’s era. The actual historical use of all these items could have been explained better. The explanatory text seems to focus more on generalisations about ancient Egypt, or the media, dating and origin of the artefacts, rather than on their relationships to one another, or the temples, homes and workplaces of ancient Thebes. Animal mummies for dedication at festivals are juxtaposed with safe-childbirth amulets as illustrations of ‘personal religion’, while replicas of a colossal (New Kingdom) head of Pharaoh Amenhotep III and the (Ptolemaic) Rosetta Stone represent ‘signature’ Egyptian royal artefacts unrelated to Nesperennub or life in his era. 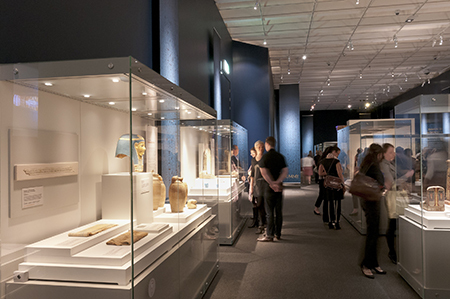 The second gallery, ‘Tombs and Afterlife’, also uses a mix of artefacts, mummies and explanatory texts to reveal the complex religious beliefs which led ancient Egyptians to preserve dead bodies and deposit them in elaborately decorated and furnished tombs. Statues, reliefs and relics from outside the tomb show how the deceased received mummification, ritual burial and posthumous offerings, while shabti-servant figurines, canopic jars, pages from the Book of the Dead, amulets, models, furniture, coffins and mummies from inside the tomb illustrate what Egyptians thought about the afterlife. Again, a more contextual approach to the display of the objects might have helped the visitor appreciate this process. I missed illustrations of actual tombs with all the goods in place, or a clearer divide between artefacts used in rituals, illustrations of the mythology of the afterlife, and actual tomb contents. The best display describes the day of burial, with actual and model ritual tools paired with steles illustrating mummification (by the god Anubis) and a funeral. The coffin of Seni was too high for this viewer to see into. Some of the objects in this gallery are concrete examples of objects seen only in scans on the body of Nesperennub, and this connection could have been made clearer. Perhaps part of this space could even have been set up to replicate the sort of tomb that Nesperennub (and the other mummies on display) once occupied. The third and final gallery is devoted to ‘The Mummy of Nesperennub’. Here, the visitor is at last able to see the exterior of this featured mummy in its original decorated cartonnage case, along with its wooden coffin and more examples of the types of amulets still within the wrappings. This is the best-arranged gallery, with a great combination of non-invasive scan illustrations, authentic ancient artefacts, and relevant modern replicas: the mysterious bowl stuck under Nesperennub’s head, his glass eyes and his snake amulet. The application of forensic techniques to ancient world studies is demonstrated not only by the scan results, but also by the full-scale reconstruction of Nesperennub’s head, which brings the visitor, at last, face-to-face with this ancient man whose mummy provides such an intriguing and educational window into ancient Egyptian life, culture and civilisation. Overall this is an illuminating exhibition on ancient Egypt, on the real significance and context of mummies, and on the important new data that is gleaned from modern non-invasive scientific imaging techniques. However, the display of artefacts falls short of its potential in making so little specific connection to Nesperennub’s own era, or to the contextual use of these types of artefacts in daily life and in tombs. The actual objects on display have been drawn from every era of Egyptian history, from the Old Kingdom to the Ptolemaic and Roman eras (some 3000 years of ancient history). Though the majority date from Nesperennub’s own Libyan, or Third Intermediate Period, (about 1069–664 BC), or the ensuing Late Period, there has been no attempt to make chronology a feature of the exhibition, and all the artefacts are made to represent ‘typical’ examples of a highly generalised ‘ancient’ Egyptian civilisation. Given the extent of the British Museum’s collections, it would have been nice to see some greater specificity about Nesperennub’s own era. The chronological diversity on display appeared to confuse some visitors, and it is not helped by Nesperennub’s own mummy being given the date only of ‘1069–715 BC’. One had to consult the catalogue’s text to learn that quite extensive (and traditional) genealogical research into the coffins, mummies and inscriptions of this man and his relatives has actually revealed that ‘he probably lived during the twenty-eight-year reign of Osorkon III (c. 780 BC)’ (p. 11). The catalogue’s other fascinating insights into the specific politics and religion of the Libyan Period, and the history of Nesperennub’s own family, would have been of interest to visitors, and could have drawn the artefacts together to present a tighter, more memorable, and more informative narrative for the exhibition as a whole. In conclusion, although I had a few concerns about the wide chronological range and poor contextualisation of the artefacts, this is a fine exhibition about a fascinating historical era, viewed creatively through the preserved body of one Ancient Egyptian man. It is clearly well-supported by hard work from the curator, Queensland Museum staff and volunteers. The latter include many of my own students from the University of Queensland’s Classics and Ancient History discipline, who answer visitors’ questions about Herodotus, hieroglyphics and the Nile. Mummy: Secrets of the Tomb skilfully combines modern and traditional museum displays to narrate the tale of Nesperennub and the broader context of ancient Egyptian gods, priests and mummies. Amelia Brown is lecturer in Greek history and language in the School of History, Philosophy, Religion and Classics at the University of Queensland.